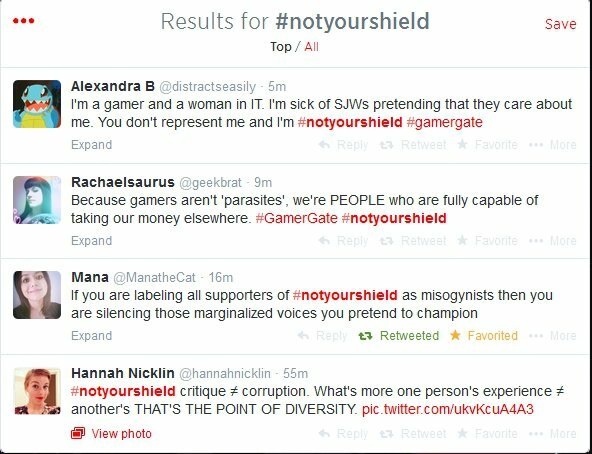 After coming under fire for supporting the GamerGate movement, females, blacks, Asians, Hispanics, transgenders, gays and bisexuals took control of their own narrative by telling those who attacked them for supporting gaming that they are #NotYourShield. The hashtag is a spinoff from the #GamerGate tag (click here for a complete rundown of what GamerGate is all about) that was coined by Hollywood actor currently starring on The Last Ship, Adam Baldwin. As noted on KnowYourMeme, #NotYourShield was a collective movement of minorities of all ages and types, stating that they were not oppressed by a straight, white male patriarchy; that they had their own voice and that they were not a shield to be silently used in order for gaming media – and those that gaming media represents – to push an agenda. At first there were tweets and comments from individuals simply feeling left out or attacked for not joining a cause they didn't support. I am a 36 year old WOMAN that has been gaming since she was 5. I'm not misogynistic. I simply stand beside what I believe is right & fair. But then they made it known that they did not stand for cronyism or corruption, and did so through uniting with a community of gamers that were composed of more than just the “white male” label that has been spun into the narrative from many major media outlets. They utilized #NotYourShield to make their voices heard and show that everyone, no matter the gender or age or lifestyle, can be a gamer, and that they did not stand for the ill-practices from major media regarding their journalistic integrity. I stand with #gamersgate. I am an asian female gamer, and you don't speak for me. I'm #notyourshield, deal with it. The website Gamerheadlines did a piece further explaining how many of these women, men, kids and those from the LGBT community have been coming under fire for supporting gamers in the #GamerGate movement, and they make it known that harassment and abuse isn't just something limited to the few rotten apples in gaming communities, it extends to all walks of human life. It doesn't make it okay and it also doesn't give one side the right to use it over the other, as indicated with the snapshot of tweets below. Interestingly enough, some gamers decided to express their love for the community not through a hashtag but through a video, with Kite Tales releasing the following video that's been trending around YouTube's gaming scene lately. The #NotYourShield hashtag has slowly been picking up steam over the past couple of days, bridging together vastly disparate communities from 4chan, Reddit, Tumblr, Twitter and Facebook. That's right, even communities that usually are at odds with each other (or at odds within their own subcultural sphere) have managed to put aside differences and show support for the gaming community that has come under attack recently from various media outlets. A lot of these communities have also rallied around the pro-feminist group The Fine Young Capitalists and their IndieGoGo, since they've been nothing more than a victim throughout this event. Even still, it's hard to quantify in 140 characters very deep-rooted personal feelings of conviction for a hobby; a lifestyle; a way of life. And yet many of these eclectically diverse and uniquely individual human beings have come forward and found a way to express kinship and camaraderie through a social media hashtag. The narrative is slowly changing, and even sites like Slate have published articles condemning and calling out the ill-practices of gaming media. It's an issue that can no longer be hidden behind attacks on “straight, white males”, especially when those supporting the GamerGate movement within the gaming community are not all straight, nor are they white, and they aren't all male. However, all of us are gamers.